Austal celebrated the christening of Expeditionary Fast Transport (EPF) the future USNS Burlington (EPF 10) with a ceremony at its state-of-the-art shipbuilding facility this morning. Burlington is the tenth of 12 EPFs that Austal has under contract with the U.S. Navy with a combined value of over $1.9 billion. 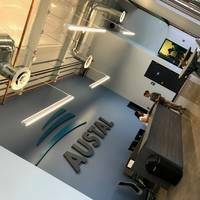 “Austal is excited to get Burlington one step closer to joining the fleet” said Austal USA President Craig Perciavalle. Rear Adm. Dee L. Mewbourne, Commander, Military Sealift Command, spoke at today’s event. The seventh Independence-variant Littoral Combat Ship (LCS) built by Austal, Manchester (LCS 14), has completed acceptance trials December 15 in the Gulf of Mexico, marking the final significant milestone prior to the warship’s delivery in early 2018. This milestone achievement involved the execution of intense comprehensive tests by the Austal-led industry team while underway, which demonstrated to the Navy the successful operation of the ship’s major systems and equipment. 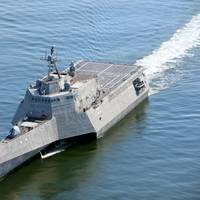 LCS 14 will be the second Independence-variant LCS Austal delivers to the Navy in less than six months. Austal said it has successfully completed acceptance trials on USNS City of Bismarck, Expeditionary Fast Transport (EPF 9), October 20, in the Gulf of Mexico. The vessel, the ninth ship in Austal’s 12-ship EPF contract valued at over $1.9 billion, is slated for delivery to the U.S. Navy later this year. “Austal is proud of the continued success of this important program evidenced by the completion of this major milestone, EPF 9 acceptance trials,” Austal USA President Craig Perciavalle said. 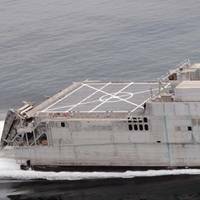 Trials involved the execution of intense comprehensive tests by the Austal-led industry team while underway, which demonstrated to the Navy the successful operation of the ship’s major systems and equipment. Acceptance trials are the last milestone before delivery of the ship. 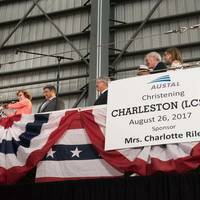 A christening ceremony was held for the U.S. Navy’s 18th Littoral Combat Ship (LCS), the future USS Charleston (LCS 18), at Austal USA’s Mobil, Ala. shipyard on August 26. “Today marks another major milestone with the christening of this remarkable war ship,” said Austal USA President, Craig Perciavalle. The ship’s sponsor, Charlotte Riley, headlined the group of officials, naval guests – including the Honorable Richard V. Spencer, Secretary of the Navy -, civic leaders, community members and Austal employees who attended the ceremony in Austal’s final assembly bay. Austal USA was recognized again as one of the safest shipyards in the country by the Shipbuilders Council of America (SCA) at their quarterly meeting in mid-May. Austal received the SCA’s Award for Excellence in Safety - the company’s total recorded incident rate (TRIR) in 2016 was 56 percent lower than the industry average. 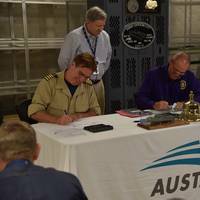 “This amazing accomplishment is the culmination of years of Austal’s dedication to the safety and health of their workers and SCA is proud to have them as a member shipyard.” SCA President Matthew Paxton said. Austal is a 10-time SCA safety award recipient since 2008. This is the 6th time Austal has been honored with the Excellence in Safety award. Austal celebrated the christening of Expeditionary Fast Transport ship USNS City of Bismarck (EPF 9) with a ceremony at its state-of-the-art shipyard on May 13. City of Bismarck is the ninth of 12 Expeditionary Fast Transport vessels (EPF) that Austal has under contract with the U.S. Navy as part of a contract worth over $1.9 billion. The ship’s sponsor, Congresswoman Jane Harman, headlined the group of officials, naval guests, civic leaders, community members and Austal employees who attended the ceremony beneath the hull of the ship in Austal’s final assembly bay. Austal USA has delivered its eighth expeditionary fast transport ship to the U.S. Navy. The 338-foot long Yuma is an aluminum catamaran capable of transporting 600 tons, 1,200 nautical miles at an average speed of 35 knots, and is designed to operate in austere ports and waterways, providing added flexibility to U.S. warfighters worldwide. The ship's flight deck can also support flight operations for a wide variety of aircraft, including a CH-53 Super Stallion. “It’s so exciting to see YUMA join the fleet; an incredible ship built by incredible people”. Austal USA proudly hosted the christening of the nation’s 16th littoral combat ship (LCS), the future USS Tulsa, here Saturday, Feb. 11. 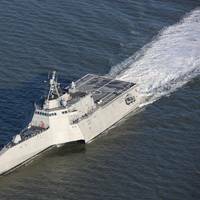 Tulsa (LCS 16) is the sixth LCS in Austal’s 11-ship contract, worth over $3.5 billion. With its shallow draft of 14 feet, the Austal-built Independence-variant LCS is an advanced high-speed and agile 419-foot aluminum trimaran combat ship that combines superior seakeeping, endurance and speed with the volume and payload capacity needed to support emerging missions. 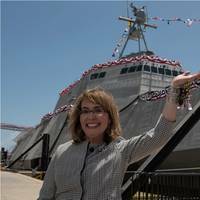 “We are proud to provide an awesome combat ship to our nation’s incredible sailors. Austal successfully completed acceptance trials on USNS Yuma, Expeditionary Fast Transport (EPF 8), January 26, in the Gulf of Mexico returning with a broom flying from the mast indicating a “clean sweep”. Yuma is slated for delivery to the U.S. Navy later this spring and is the eighth ship in Austal’s 12-ship EPF contract valued at over $1.9 billion. 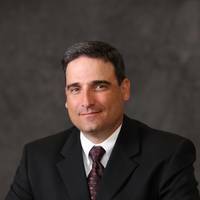 “Yuma’s ‘clean sweep’ trial was another significant milestone in the continued success of this important program,” Austal USA President Craig Perciavalle said. 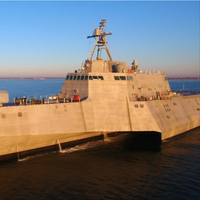 Austal delivered the fifth Independence-variant littoral combat ship (LCS), the future USS Gabrielle Giffords (LCS 10), to the U.S. Navy on December 23, exactly six months from the date LCS 8 was handed over, at an official document signing ceremony held aboard the ship. 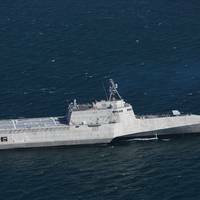 This milestone marks the third LCS built by Austal as the prime contractor. “It’s exciting to be handing over another littoral combat ship to the Navy,” said Austal USA President Craig Perciavalle. 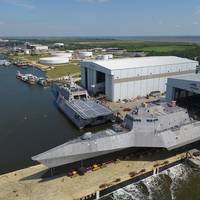 Six Independence-variant LCS remain under construction at Austal’s Alabama shipyard. 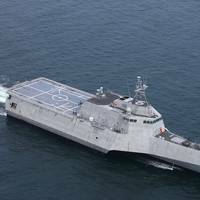 The fifth Independence-variant littoral combat ship built by Austal, Gabrielle Giffords (LCS 10), successfully completed acceptance trials, Nov. 18, in the Gulf of Mexico. “I am proud of Austal’s achievement of another major milestone in the LCS program.” said Craig Perciavalle, President of Austal USA. “The steady increase in momentum on this program, with seven LCS currently under construction, has sharpened our focus on leveraging lessons learned from one ship to the next. 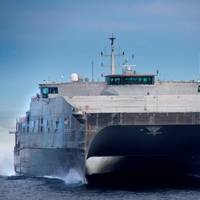 Austal USA said it was awarded a $326 million contract to built the 11th and 12th Expeditionary Fast Transport ships (EPF) for the U.S. Navy. This new contract adds upon a 2008 fully-funded EPF 10-ship block-buy agreement and brings Austal’s current build to a 12 ship program valued at $1.9 billion, and thereby extending the shipbuilder’s production under contract into 2022. Austal USA’s EPF program has seen seven ships delivered so far, with three more under construction at its headquarters and ship manufacturing facility in Mobile, Ala.
Austal USA’s Expeditionary Fast Transport (EPF) team finalized the delivery of USNS Carson City (EPF 7) to the U.S. Navy during a small document-signing event held onboard the ship on June 24, 2016. The EPF program provides the Navy with a new high-speed intra-theater transport capability. The 338-foot long Carson City is an aluminum catamaran capable of transporting 600 tons, 1,200 nautical miles at an average speed of 35 knots, and is designed to operate in austere ports and waterways, providing added flexibility to U.S. warfighters worldwide.